Bring the good times of the bar, tailgate or BBQ into your home with this Officially Licensed Budweiser canvas print.Whether its game day of having your friends and family over for a few laughs, this Officially Licensed Budweiser canvas is the perfect way to accent any garage or man cave. Toast to the King of Beers by bringing a piece of Anheuser-Busch's rich history into your home. Giclee´ (jee-clay) is an advanced print making process for creating high quality fine art reproductions. The attainable excellence that Giclee´ printmaking affords makes the reproduction virtually indistinguishable from the original artwork. The result is wide acceptance of Giclee´ by galleries, museums, and private collectors. 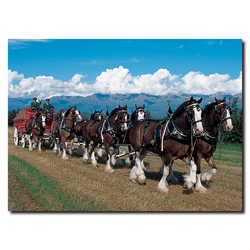 This Vintage Budweiser Artwork measures 14 x 32 inches.